When you think of Egypt the only thing that comes to your mind is those huge pyramids and the mystery behind the country. 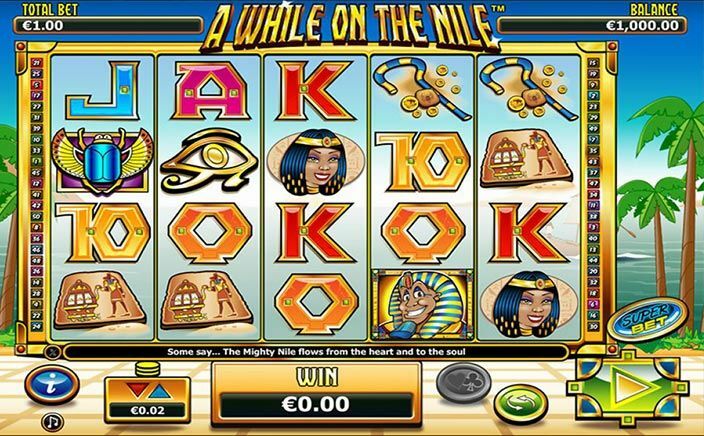 Have a glance at the ancient looking slot game titled as a While on the Nile. This mysterious slot game consists of fifty paylines and five reels. As you are on the ride for your money then keep looking for some exciting rewards in this game. Take a breath while you are spinning the reels and win some mammoth multipliers. NextGen Gaming has designed a while on the Nile slot game which is wonderfully designed. It is a part of NYX Gaming group and was established in the year 1999. NextGen Gaming provides gameplay enhancements such as SuperBet, up wild, select a wild and many other features in the slot games. A while on the Nile brings the era of classic slot gaming right at your fingertips. This joyful ride of spins can be played by fixing a bet from 0.50p to £10.00. Pharaoh’s Staff, a stone tablet, Eye of Horus and Cleopatra are the main symbols in this game which will help you to win a huge multiplier of x1, 000. The smaller symbols such as J, Q, K, A and 10 will increase your total stakes up to 100 times if you get three or more combinations right. The jewel scatters symbol acts as a huge bonus where your free spins can go up to 5 rounds if you manage to spot the symbols on reels three, four and five. For all the players who fancy their chances of winning free games then get ready because this game has additional game features if you manage to land on three or more jewel symbols. The game intrigues you with its outstanding bonus round titled as Scarab Bonus round which will be automatically triggered if you get three identical symbols on the reels. In the Super Bet feature, you have the opportunity to adjust your wager amount and your total stakes are increased by 10 times. In the Autoplay mode the reel automatically is set to play 100 rounds, so sit back and check if you have won some rewards. 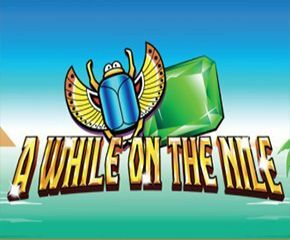 A while on the Nile is an entertaining slot along with some great surprises such as the Scarab bonus rounds, Scarab bonus and many others.